Very popular semi-automatic Hog Ring Pliers, handy for the home or farm. The RP-22 is designed for durability and single handed jamb free operation. 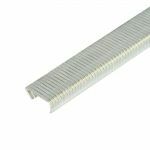 It has a weather proof finish and is supplied with 2 strips of Galvanised wire Hog Rings. From big fencing jobs to handycrafts and upholstery work it will save you time and give a professional result.